For the mussels, soak mussels in a bowl of cool water for 20 minutes to help remove any sand. Drain, rinse well, then drain again. Heat a large soup pot over medium heat. Add oil, shallots, garlic and pepper flakes and cook 2 to 3 minutes, or until garlic is soft. Add tomatoes, broth, wine, vinegar, sugar and salt and bring to a simmer; cook for 10 minutes. 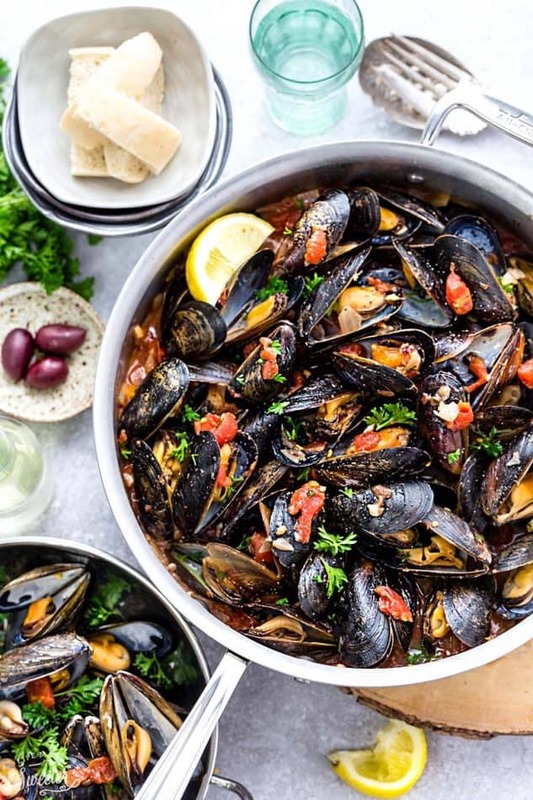 Add butter, allow to melt, then add mussels, cover and simmer for 10 minutes, or until mussels open; discard any unopened mussels. Stir in olives, basil and zest. Meanwhile, for the grilled artisan bread, heat grill pan over medium-high heat. Mix oil with garlic, then brush mixture onto both sides of each slice of bread. Working in batches if needed, arrange bread on grill pan and cook, flipping once, until golden and crisp all over, 5 to 6 minutes total. Scoop mussels and their broth into bowls and serve with warm grilled bread on the side.